The 6-9 Teacher Bundle includes instructional design materials that can be adapted for grades 6-9. It also includes materials to help the teacher learn and begin to internalize the concepts of critical thinking. 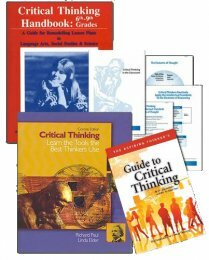 The Thinker’s Guides included help deepen a teacher’s understanding of the foundations of critical thinking. 10BUND 6-9 Grade Teacher Bundle $54.95	 Qty.